We come together to give thanks for the blessings we have received. Prayers, music, sacred writings, reflections and meditation will be woven together with a common theme of Coming Together from many traditions and Welcoming All. Hospitality Reception featuring foods from various traditions follows the event. To serve the needs of our community, collections will be taken for Addie’s Food Pantry. In memoriam of beloved members of our interfaith community, donations will be accepted for local Hospice efforts in memory of Sr. Sue Tracy, and Make A Wish Foundation Michigan in memory of Sami Bannister. Please bring non-expired non-perishable food items for Addie’s Food Pantry. A cash donation will also be collected at the event. The Grand Rapids Interfaith Thanksgiving Celebration has been celebrated annually since the year 2000. 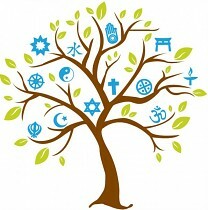 The event features participation from a wide variety of Christian denominations and representatives of Native American, Jewish, Muslim, Baha'i, Buddhist, Hindu, secular, and inclusive religious communities.